Art, Design & Architecture series. 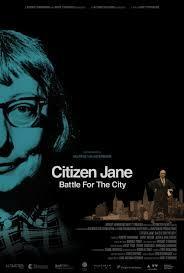 “Citizen Jane: Battle for the City, directed by journalist and documentarian Matt Tyrnauer, tells the story of a David-and-Goliath fight over urban planning that took place more than 50 years ago. Yet the movie just about pulses with contemporary resonance. “The movie features two nearly mythological antagonists. In one corner is Robert Moses, the New York construction czar who, in the years after World War II, transformed the city by gutting its poorer sections and erecting miles of concrete-slab housing projects and snaking superhighways. In the other corner is Jane Jacobs, activist and author who led an uprising against Moses’ dehumanized dream of a paved-over utopia. Copresented by Jane's Walk Waterloo Region.